...that's what styrofoam is to me. Dare #130 is up – pet peeves. Styrofoam (the feel of it, the sound of it) is the number one thing that I cannot stand. If I'm in the same room as someone who is unpacking stereo or computer equipment packed in styrofoam, I squeal and run away as fast as I can. It makes my teeth hurt. I hate touching it at all, but worst of all is when two pieces touch each other and it makes that squeak. I'm cringing just typing this. If anyone was to ever torture me, this would be the way to go. Stapling this piece of styrofoam to my page (and writing on it with a Sharpie) was physically painful for me to do. But there you go. For the love of The Dares. Friday is here once again, we're unfortunately not going to make it to see Andrew Bird at Hoyt Sherman tomorrow (but that's okay because we saw him play last summer) and I feel a coffee date coming on. AND, weather permitting, my BFF Jane + girls and I are heading up to Minneapolis for a day of fun tomorrow. YAY weekend! Ugh I hate styrofoam too! And it also makes my teeth hurt, some people just dont understand that statement so Im glad to see Im not the only one!! 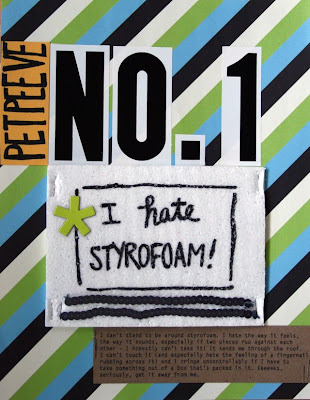 Styrofoam is the scurge of our landfills! One of the many, anyway.... your page turned out super cute, I love the dares. They are such a great way to think outside the norm!